Greetings from Montana. This is my first post so let me know if it's helpful. So my '75 Z has been sitting in a garage since 2013 on account of the clutch pedal lost its pressure and the fuel system was all gunked up with rust. I went off to school so I had no time to work on it. I came home this summer and have been working on it for a month or so now when I can afford it and have the time and finally this weekend it should drive once again! I came to the conclusion that the priority would be the gas tank and fuel system. So I dove right into draining the gas and stripping the tank from the car. What I had found next was a nightmare. Layers upon layers of rust in the gas tank! First thing I did was sloshed around quite a few nuts and bolts with some old gas and banged on it very carefully with a hammer to break some of those rust chips up. I drained what I could of the broken rust pieces and began my search for a cheap alternative for a rust removing chemical. Come to find out, white vinegar works wonders if you submerge and soak rusted metal for a couple days. I got 17 gallons of the stuff for 2$ a gallon at costco because you will want to fill the entire tank to prevent flash rusting on exposed metal. I filled the tank and sealed it all off with duct tape except for the small tube at the very top of the tank so it could breathe the fumes. I let it soak for 3 days like this and I would suggest placing whatever you are going to drain the vinegar into underneath the drain plug BEFORE you fill it because you won't be able to lift it yourself after it is full of 17 gallons, unless you are Hulk Hogan. Once you are satisfied with the amount of time it has soaked(anywhere from 24 hours for minor rust to 3-4 days for caked on rust), unscrew the drain plug and commence draining. After all but about a gallon or so has drained, grab hold of the tank and start rocking it back and forth and 360 degrees, slowly to get all the flakes to drain. You could bang on it with a rubber mallet or hammer again as well. Once it's all drained, take your phone camera and put it on video with the flash on and poke it inside the sending unit hole. You will be amazed looking around at how well the vinegar works. You will see mostly bare metal. Unplug all the holes and allow it to dry for a day or so. I taped an air compressor blower to one of the holes to give it a blow dry for about an hour right after I drained the vinegar. 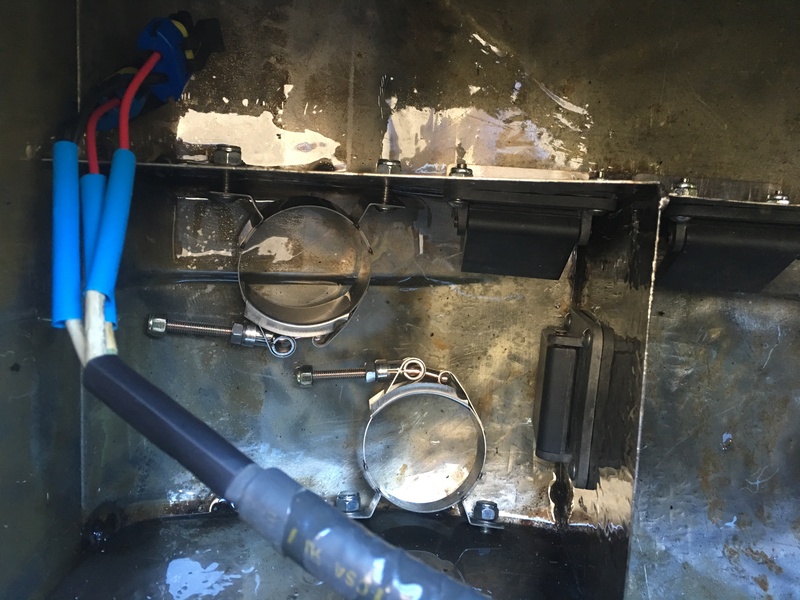 There will be flash rusting and there is nothing you can do to avoid that unless you wipe it clean with a rag right after it has drained, which is impossible with a gas tank. But don't worry the next step will cover that. Now go to your local car parts store and ask for a liquid gas tank liner, any brand will do. Make sure you read the directions and get enough, especially if you want to do 2 coats. They usually come in 1 quart cans that will usually only cover about 12 gallons. The brand I got was this way. For my '75 280z the gas tank is 17.2 gallons so I had to get 2 quarts. Once you are satisfied that your tank has dried completely, it is time to put your first coat on. Look inside your tank and you will see that it has a divider to the skinny part of the tank. For this reason, I plug all the holes except for the sending unit hole on the tall part of the tank and the gas outlet hole on the narrow part of the tank. This allows you to fill both halves without worry of missing a spot with the coat. You need a good funnel for this stuff. Fill the narrow half with one quart first because it takes longer. Then fill the sending unit half with the remaining quart. Plug the remaining holes. Very slowly roll the gas tank around in your arms 360 degrees on all planes for about 15 minutes or until you think every spot has been touched by the good stuff. It's kinda like the consistency of molasses and it dries like a rubber glove so be thorough. After rocking it around on all planes I would let it sit on it's bottom for 5 minutes then on it's side for 5 minutes then on it's top for 5 minutes then on the other side for 5 minutes and back again on the bottom. I did this for an hour or so while I was changing the oil. I wanted to make sure that bare metal would not show. Once you are satisfied, place it on top of some saw horses or an old cooler or something and place one of the liner cans under the drain plug and unscrew it. Remove all plugs so it can dry evenly. On all the small openings, I took my air blower and blew a small amount of air through to make sure the liner didn't plug them. I would highly recommend this. Let it dry for a day. Come back and check to see if it dried evenly. If there are bare spots, do a second coat, if you have enough left over liner. I did anyway. Let it dry for a day and a half just to be safe. This next step isn't necessary but I recommend doing it since you already have the hunk of junk out. Get a can of rust proof spray enamel from your hardware or car parts store. You could get any color you want. I just got black cause I don't know what the paint job will be on the car yet. Tape all the holes, Air blow it free of debris and sand the rusty spots, air blow again, then commence spraying the enamel. Let it dry. Now that the gas tank is complete, check all your filters. My Z had a small filter between the outlet and the fuel pump. When I took it out, it was pack full of rust to the brim. I have looked all over the market and can not find a part to replace this filter. I tapped all of it out and submerged it in vinegar as well. 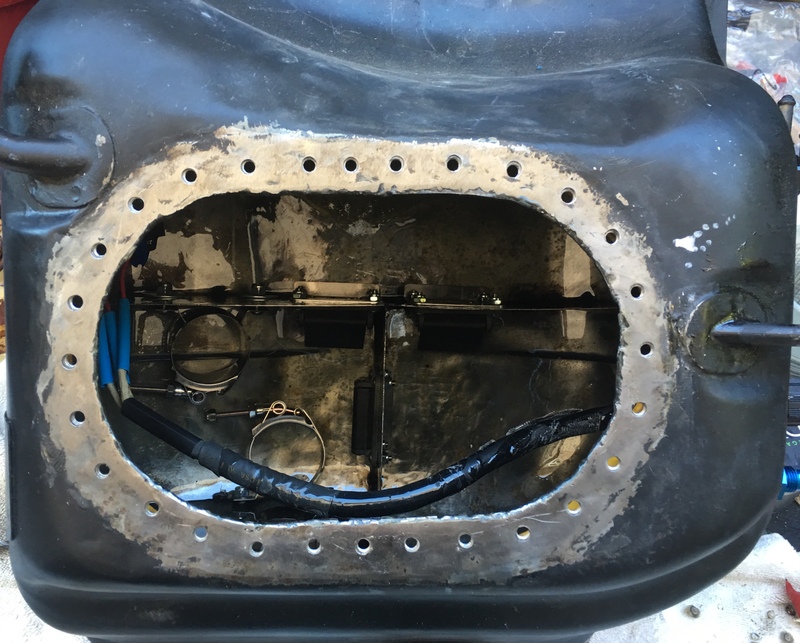 There is a strainer between the fuel pump and the fuel line to the block. I removed that and soaked it in vinegar. I installed a new fuel pump while I had the gas tank out. And there is another larger fuel filter by the engine block under the hood. I just got a new one of those for 20$ and installed it. Once your tank is completely dry, put it all back together. I suppose you could seafoam the system and bleed it if you want to go a step farther. I probably won't since I know the gas tank is good and that is the source of bad gas. I figure any bad stuff that remains will get washed out and burned off in a day of driving. Thank you. That's an excellent write up and very helpfull!! This what I did to my tank, add chambers with gates to create a surge camber that have two walbro 450lph. The other chamber has fuel cell foam to keep the fuel from sloshing around. The center chamber is still open so I can have to stock fuel gauge sensor. Hey man that's pretty slick. A lot of people don't realize putting in some hard work on the gas tank can really up your performance. Looks good man!